Evil Unseen by Dave Sivers. Author Interview & Review. Following the publication of Evil Unseen by Dave Sivers last Thursday, I’m delighted to present a brief author interview and my review of the book. Dave Sivers grew up in West London and left school at 16 to embark on a civil service career that took him to exotic places like Rhode Island USA, Cyprus, Brussels, Northern Norway and Sutton Coldfield. Along the way, he moonlighted variously as nightclub bouncer, bookie’s clerk and freelance writer, as well as picking up a first class honours degree from the Open University. Writing has always been his passion and, since giving up the day job, he has launched a second career as a novelist. The first two books in his popular Archer and Baines crime series set in Buckinghamshire’s Aylesbury Vale – The Scars Beneath the Soul and Dead in Deep Water – reached the top three in the Amazon Kindle Serial Killers chart and the third – Evil Unseen – has just been released. His other work includes two hybrid ‘crime fantasy’ novels featuring personal inquisitor Lowmar Dashiel. Dave lives in Buckinghamshire, England, with his wife, Chris. Q1. Where did your love of storytelling come from? That’s a complicated one. My love of stories definitely comes from my mum, who always read to me when I was little and taught me to read before I started school. A primary school teacher, Miss Jones, read us C S Lewis’s The Lion, the Witch and the Wardrobe in daily instalments and showed me how great a book could be. But telling my own stories… it seems I always wanted to, from about six years old. It’s just always been in me. Q2. Who are your current favourite writers? Wow, how long have you got? Always Stephen King – although I don’t read him quite so avidly these days, I still read at least one of his books a year. I love Stephen Booth’s Cooper and Fry series – he showed me that rural crime doesn’t have to be cosy – and Anya Lipska’s Kiska and Kersaw series. Sarah Hilary’s Marnie Rome novels are stunningly good and I’ll always read anything by Sharon Bolton or Ian Rankin. My book of 2015 was I Let You Go by Clare Mackintosh, and I can’t wait to see what she does next. Q3. Do you already have in mind what will happen to Archer and Baines in future books, or do you plot the character development for each story as you come to it? A bit of both, to be honest. I know a lot about their story arcs – at least up to a point – but some of the secrets are still revealing themselves to me. Certainly a fair bit of the detailed development only happens as the book unfolds. Without risking any spoilers for Evil Unseen, I will say that I know the answers to the bigger mysteries in the series – it’s not like certain TV series where you sense that not even the writers have a clue. Q4. What sort of “vital jobs” do you find yourself doing when you should be writing? Ah, this depends on whether you’re talking genuine vital jobs or procrastination. I have a part-time job with no set pattern, an allotment that doesn’t maintain itself and often requires me to take advantage of drier weather, and one or two other things that actually do need to be kept on top of. But yes, I procrastinate like most writers: fiddling around on social media longer than I plan to; tidying the chaos of my desk, only for it to return to its former state by the end of the day; making another cup of tea, which always seems to segue into displacement activities. When I’ve got a decent block of writing time though, and have fallen through what Stephen King calls the ‘hole in the page’, it takes a lot to pull me out of that world. Q5. What three books would you take with you if you were being whisked away on a surprise holiday tomorrow? Sharon Bolton’s Little Black Lies for sure. It’s on my Kindle and working its way to the top of my To Be Read list, but she’s always such a great holiday read. Steve Cavanagh’s The Defence. And one from my unread Stephen King pile – I’ll take the Just After Sunset collection. Q6. What question do you wish that someone would ask about your books, but nobody has? And what’s the answer? Aargh – I’ve never thought about this. All right then – Question: if you could set a novel anywhere in the world and someone was prepared to pay for you to live there while you wrote it, where would you choose? Answer: My short list would undoubtedly include somewhere on New Zealand’s South Island, maybe Burma, certainly New Orleans, my favourite city in the world. But an awful lot of crime has been set in New Orleans, and the jazz might start to grate on me, so I think I see a country music star meeting a nasty end in Nashville, Tennessee. I could do my research at The Grand Old Opry and the Bluebird Café, and spend my days with my laptop in cool cafés around the city. After six to nine months there, I might have problems getting home with all the guitars I’d be tempted to buy though. This third book in the Archer & Baines series is the best yet. If you enjoy a crime thriller that keeps you guessing throughout, you’ll enjoy this read as much as I did. “Even the dead have their secrets. I’ll admit the thing I was looking forward to most when I started Evil Unseen was catching up with the personal stories of the two main characters. Baines has one of the most intriguing back stories of any crime series character I’ve come across. In this book he’s struggling to keep his temper at times and this introduces an extra element of tension to the story. Lizzie Archer has her own domestic developments waiting in the wings for when she can drag herself away from the case. Without delving into spoiler territory, one part of the plot that the author deals with skilfully is that on this case Archer and Baines aren’t sure who they can trust, even in their own team. This kept me guessing throughout and was an absorbing theme alongside the rising body count and the race to prevent any more murders. I enjoy the style of writing in this series and the way the author weaves in items of interest in the local area, showing the results of lots of research. And finally, I enjoyed meeting my namesake – part of a prize I won in the Authors For Nepal auction was to have a character named after me in this book. Thank you to Dave Sivers for this and for a the advance copy e-book to review. Or should that be what’s in a proper noun? A little background: Eight weeks ago our gorgeous grandson Oliver was born. My dilemma? What will he call me? I wanted to be Nanna. I called my mother’s mother Nanna and my daughter calls my mum Nanna. However, my mum doesn’t like the idea of Great-Nanna and two nannas would be confusing. Ollie’s other grandmother is Grandma so even if I liked it there’d be confusion again. And living in Blackburn, Lancashire Grandma is pronounced Granmer (yuck). 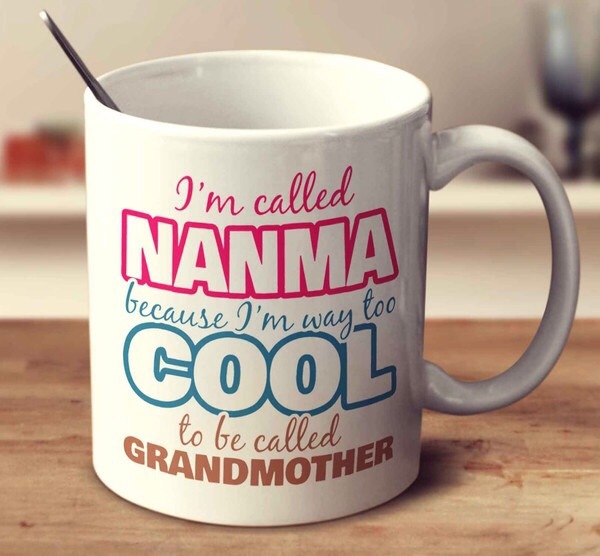 My daughter and I came up with Nanma which we thought we’d invented until I saw the picture of a mug online. So here’s what I’ve decided. Ollie’s not bothered whether I’m Nanna, Grandma (Granmer) or Nanma as long as I bring him a bottle/nappy change/cuddle when he wants one when I babysit. I’ll answer to pretty much anything until he decides what to call me when he’s older. Any funny or original grandmother names to add to my list for him to choose from?